Forum Index > Historical Arms Talk > Identify this Rondel Dagger? Posted: Thu 23 Nov, 2017 3:46 pm Post subject: Identify this Rondel Dagger? 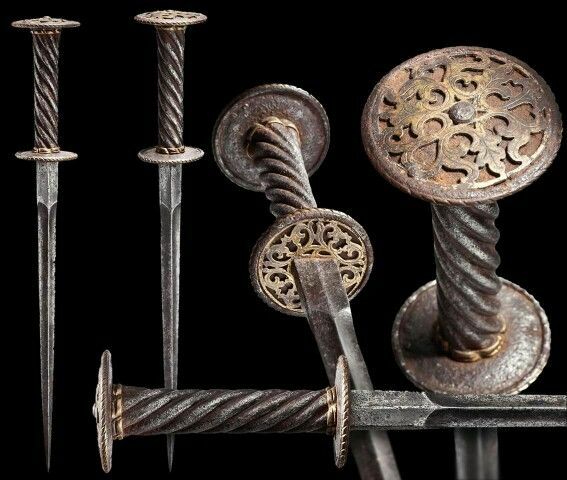 "A rare decorated rondel dagger, Italian/South German, 1st quarter of the 16th century Double-edged blade of hollowed diamond sec"
For some reason, I have it in my mind that this piece is in the Musée de l'Armée in Paris, but I can't find a citation for that. Has anyone here seen it? Thanks. That photo was one that I created. It was snagged from the myArmoury.com Facebook Page. You can find the specific photo In the Rondel Daggers Album. Double-edged blade of hollowed diamond section with a pronounced ricasso. Helically cut iron grip and bronze grip ferrules retaining some of their gilding. Slightly different sized discs on both ends with corded and gilt bronze borders. Engraved and gilded, decorative floral bronze openwork overlays riveted on the top and bottom. Iron surfaces somewhat pitted. As you can see, the dagger was in an auction from Hermann Historica. I don't have any specific info to back this up, but there's a very good chance that is in the style of the 16th century and not authentic to that time. Wow, so sorry to see that you're the victim of such a ripoff. On the flip side, I need to go peruse that album. I've basically stopped making original content because it's taken and used all over for other peoples' purposes. The composite you created pops up most often on Pinterest, which to me is a showplace for "cool stuff I found on the web". Still, they should have credited you. And all that aside, I'm curious as to why you think that may be of the style of the 16th Century but not authentic to the 16th Century. Is there anything specific that screams out, "this doesn't look right for this time period"? Because one has to use critical thinking when assessing objects from Hermann Historica, or really any auction house.